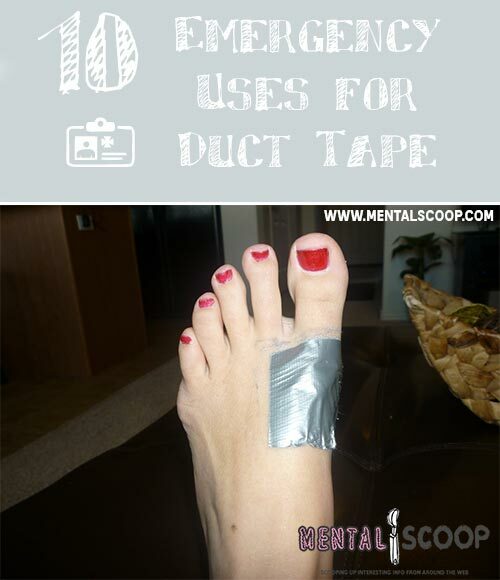 Duct tape can be a lifesaver, and yes, I’m not kidding! When it comes to having a variety of uses, the lowly duct tape has come a long way. In fact, if you are interested in survival and disaster preparedness, duct tape should be a part of your arsenal of supplies. I admit that I have a fondness for duct tape and not just because it’s a temporary fix-all solution for when I’m having a fit of laziness (hey, I’m human!). Take a look at the following 10 Emergency Uses for Duct Tape and let us know what other uses you have for these shiny silver-grey strip of adhesive tape. Okay, this may not be a major lifesaver but you can’t buy those sticky fly catcher boards anymore, you’d love to use some duct tape to save the same purpose. Mosquitoes and flies can carry diseases, so using duct tape to trap them may actually be a lifesaver. Back in my younger years, I would use duct tape to temporarily hem my jeans prior to getting them tailored. I may have also gone on a date or two back in the day with duct taped pants (not that I’m admitting anything!). The best part? The tape will hold for several washes too! Do you know that duct tape can actually withstand temperatures of up to 200 degrees and that it can also withstand being dosed in water? In fact, duct tape was originally called ‘duck tape’ for many of its duck like water qualities. If your garden hose got a leak, you can fix it temporarily by patching it up with some duct tape. This works on small boat leaks too! Please remember that this is a temporary fix until you can get a mechanic to work on your car. When you’re on the road and have no mechanic nearby, or worse, you’re stuck in a disaster event, one of the emergency uses for duct tape is to patch up your auto hose, but again, only temporarily. I’m not talking about Sherlock level style of hiding things, but when you need to hide an extra set of keys under your car for emergencies, using some duct tape on it makes it safe from getting dislodged or lost. Duct tape is water resistant. This means that anything you wrap in duct tape basically becomes water resistant as well. You may not be a fan of prom dresses and purses made from duct tape which is all over Pinterest (the wife showed me), but if you find yourself in the woods or stuck in a storm with nothing but your cotton shirt on and some duct tape, wrapping your shirt in the shiny silver-gray tape to form a water resistant and insulating layer before the temperature falls can save your life. Another one of the emergency uses for duct tape is for making rope. If you take strings of duct tape and twirl them together, you can actually make a very strong rope. This would surely come in handy when you need strong rope or cordage. Patch up tent holes in a jiffy with duct tape. If you have ripped clothes, you can also use the same technique to temporarily repair it. One of duct tape’s original uses is for medical purposes when it was first made. You may not love it but if you have no band-aids or if you got a large cut which needs stitches but no immediate way of getting to a hospital, strips of duct tape can serves as a temporary suture or emergency band-aid. In fact, you can even create a sling or splint as one of the emergency uses for duct tape if you got injured and medical help is not available. And not just ticks, any type of small crawlies which can get under your clothes when you’re out hiking or hunting. Just strap the duct tape around the cuffs of your pant to keep out these insects and other nasty crawlies.